My ECO test went surprisingly well today, maybe not an A or a B but I don't think I got a 36% on it this time ^^;; Been watching some figure skating competitions that I downloaded. Wow those jumps and spins never fail to amaze me. How I wish I can do that *-* I can only do the basic basic of going forward, backwards (though really awkwardly), stopping, and that's about it. I love the feel on the ice when you're gliding along and the wind blows your hair back, and how easily you can spin (it happens sometimes when I stop, my feet naturally does a little spin-around). And when I want to go super-fast, I crouch down low and zoom around with almost no effort at all, it's such an amazing feeling. Here's a video of Michelle Kwan, she's a famous USA figure skater who's won several world championships. Her skating is absolutely amazing, not only are her jumps solid, but her straightline footwork is astounding, not to mention her energy and spirit, just wow =*-*= This was her 2004 Nationals long program, in my opinion it's one of her best skates. I remember watching this one on tv her energy at the end literally sent shivers down my spine. [EDIT]: Is anyone else having this problem with firefox in that when you go watch youtube videos on firefox, the video either doesn't load or it loads part way and just stops? When I go to watch the same videos in Internet Explorer they work fine....strange. Awww! Figure skating! I've been so neglecting it this season mostly because Michelle Kwan isn't skating and most of the other ladies just aren't very interesting. Actually, for the most part, I am more interested in the men's and pairs' competition. i think its just youtube and not working propely today. i use explorer and youtibe does the same thing to me sometimes. lol i used to love alexei yagudin :P:P.. now THAT was awesome footwork.. *drools*... not bad to look at either lol XDD... i loved his gladiator exhibition program during 2000 or 2001 Worlds.. (forgot which).. but he had like a massively swollen sprained ankle during the time lol.. and then that stupid evgeni plushenko started climbing the ranks! ARGH! hahaha. Ah actually it wasn't that one, I thought something was missing when I watched it. 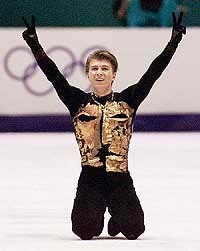 It was his short program from the Salt Lake City Olympics that had me glued to the tv screen(he previous one was his long program). ah lol. i don't remember what song this was. i do remember that salt lake was really controversial about figure skating judging, with that whole debacle about jamie sale and david pelletier lol. oh man i love yagudin. they prolly have to repave the ice every time he's done lol cause his signature footwork chews it up lol. Ah yeah that whole fiasco with the judges, but those two were in pairs, and he's in singles, so it should've been a bit calmer. i don't think they can have that many people training at the same rink cause you wouldn't be able to book sufficient ice time lol..
anyway lol lovelovelove yagudin :P.
The four continents championship is this weekend! I'm pretty excited to watch it. I LOVED Elvis Stoijko. Do you remember his program with the drums? It had a japanese theme to it, I think. Nobody can do spins like Elvis can. I also love watching Emanuel Sandhu. He has so much potential, everyone knows he does, but it's almost never there. There's falls and popped jumps and it's frustrating b/c he can be so awesome. He loves his skating, it's obvious whenever he ends a program and has done well . . . that smile on his face and his bows to the crowd, if only he could feel the confidence we all feel for him! I think I've only ever seen 1 program that Stoijko did when I was really young, I remember he was pretty good, but by the time I was old enough to actually really get into the sport he was already off the scene. God just watching the guys' programs I have to admit their jumps and spins are much more powerful and solid than the girls' are. Guess when it comes to muscle power all the feminism in the world can't equalize that. Oh was this the drums one you're talking about? Elvis was AMAZING. He still is! There was just so MUCH energy in his program! He was the first man in the world to add a quad as regular part of program. It's a shame his injury really hampered him so much that he withdrew and went pro. but there a few woman who have a lot of height when they jump and others spin so fast! I really suggest seeing an Emanuel Sandhu one. He can be so awesome as well. Yeah, I thought that was pretty cool so I decided to leave you a comment XD Plus we are in some of the same communities as well. Anyways, is it ok if we become lj buds? It's not everyday I find someone from Ottawa who likes the same things as me. Well, on your lj profile it says that you are in International Development and Globalization so unless you switched majors then we are in the same program =] I'm in third year right now. How do you like the program so far? I really like it. Nice to meet you too ^^ ... What's your name? I'm in second year of the program, it's pretty cool. I've learned a lot of stuff these past year and a half, although I do find a lot of the courses fairly repetitive when it comes to international issues and such. I do take a slight sadistic satisfaction when I start rambling on and on in political jargon about IMF and SAP's and my non-politics friends get this "@____@??" look on their faces lol. It's good and bad. I find it's nice to refresh your memory but bad as you might get bored because you already learned it. Haha, I don't really talk about what I learn to my friends because they're not really all that interested to even hear me out. Mengya... I'll try to remember. Yeah I have that problem with my friends that aren't in politics too. I mean most of them I can skim through political topics with and they can still understand where I'm coming from, but if I start going too deep into any particular issue they start giving me the swirly eyes lol.